K-9 Sweeps brings the Heat to Las Vegas! 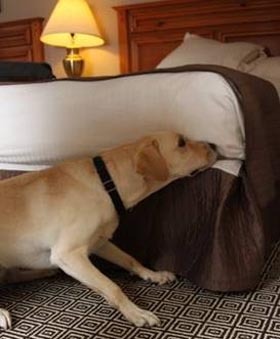 K-9 Sweeps, the only “bed bug-only” pest control company located in Las Vegas, and the first in the area to offer bed bug dog inspections, offers the most effective and environmentally responsible way to eliminate bed bugs – Bed Bug Heat Solutions. Our proven method of killing bed bugs is eco-friendly, replacing chemical pesticides, and involves state-of-the-art high tech, hydronic heat to completely eliminate bed bug infestations with one treatment. Most competing systems lack the power required to heat an entire structure. As a result, treatments often progress slowly, room-by-room, often spanning multiple days and limiting the overall effectiveness of total eradication. What makes our Bed Bug Heat Equipment the best? We control the temperature digitally, down to 1 degree increments. Not too hot, not too cool…just right! We continually monitor temperatures in the heated structure, utilizing state-of-the art wireless temperature sensors and remote laptop computers. Our controlled source of heat is more efficient, effective and safer than any other heat options on the market. We provide our customers a printout showing the temperatures within the heated area. We are able to heat treat a 2,800 square foot home in one run and up to 5,500 square foot space in one day. We need nothing more than a standard household 115v 15amp outlet. We use heat exchangers that increase efficiency by improving heat distribution and air flow. These are not heaters with electric heat elements like you would find on a space heater. The heat we produce is Dry Heat! One bed bug treatment kills bed bugs of all life stages. Why Choose K-9 Sweeps as Your Bed Bug Exterminator? Simply put, our methods work. Guaranteed! Our bed bug heat treatment system is the most high-tech, state-of-the-art, safest and most effective bed bug treatment system in Southern Nevada. We offer the best value with the most comprehensive bed bug extermination guarantee in the Las Vegas market. We have the knowledge, tools, experience and skills to successfully inspect for and eliminate any bed bug infestation and will always recommend the correct treatment based on your situation. We are the only LOCAL Las Vegas Pest Control Company that specializes in only bed bugs!